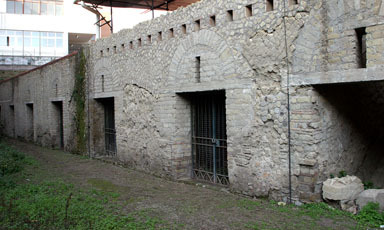 The site of Villa B lies approximately 300 meters to the east of Villa A, and like Villa A, it is a building of the Roman era that was destroyed by the 79 C.E. eruption of Mount Vesuvius. Though located very near the luxurious and sprawling Villa A, Villa B is strikingly different in what it preserves, and from its remains we can also surmise that it had a very different function from its opulent neighbor. 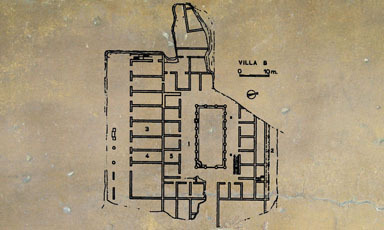 Whereas Villa A is clearly a luxury villa designed for otium, or leisure, Villa B may not even be a villa in the traditional sense, but rather some type of emporium or distribution center. Its spaces are meant not for leisure but for negotium, or industry. Moreover, the presence of two nearby roads, and what may be a row of townhouses to the north, suggests that Villa B occupies a position in a small settlement or town, perhaps even the town of Oplontis itself. 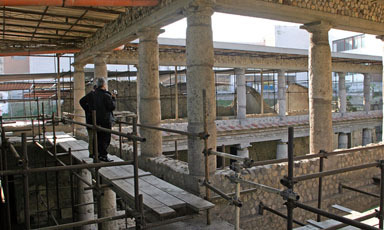 The structure’s plan reveals a central courtyard surrounded by a two-story peristyle of Nocera tufa columns. Excavators uncovered and restored more than seventy rooms, on both ground- and second-story levels. On the ground level, barrel-vaulted rooms, each with a single large doorway, line all four sides of the courtyard. These ground-floor rooms preserve little or no decoration and reveal masonry predominantly in opus incertum and opus reticulatum. Excavators found remnants of a wooden stairway to the upper floor at the northeast corner of the peristyle; its impression is still visible in the wall plaster. At the south corner, a low structure comprised of thin rubble walls may have been a latrine. The eastern side preserves what seems to be the primary entrance into the courtyard. On the south side of the building, and facing south, eight storerooms open onto a what may have been a large portico. To the west stand the partially-excavated remains of two rooms that belong to another building. To the north, a small street separates Villa B from what appears to be a row of two-storied houses (also only partially excavated) that faced the north side of the villa. During coring operations sponsored by the Oplontis Project in 2009 and 2010, geologist Giovanni di Maio found evidence of a road to the east of the villa, in an area that is still unexcavated. This road is likely to be a north-south road running along the eastern facade of the complex; it was probably from this road that one entered the courtyard. Villa B preserves very little evidence of decoration. Only simple white plaster of a type common to utilitarian spaces in Roman buildings survives on the ground floor. The upper-floor rooms preserve some simple painting schemes, most datable to the Fourth Style (C.E. 45-79). These include simple designs of color fields with carpet borders. There is a fragmentary Nilotic painting, later covered by Fourth-Style painting, as well as a painted lararium. Preserved in another room is a fragment of schematic Second-Style decoration (ca. 50 B.C.E. ), a carry-over from an earlier decorative phase. Beyond the unique physical structure of Villa B, perhaps the most significant aspect of this site is the fact that it preserves unparalleled material for new study in several underrepresented areas, including human remains, foodstuffs, coins, jewelry, and transport vessels. In the courtyard and ground-level rooms, excavations uncovered over 400 amphorae. Perhaps the most significant of these are the stacked amphorae still in place at the northwest corner of the courtyard. That these amphorae had been cleaned and stacked upside down to dry tells us that they were meant to be re-used at the site (fig. 3. Amphorae in northwest corner of courtyard). 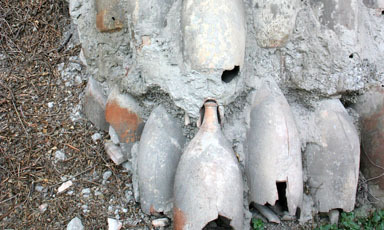 Supporting this assumption is the discovery of a small stone oven nearby containing a small pot with pine resin, suggesting that—among other things—in this courtyard workers prepared storage amphorae, certainly for wine, and possibly for oil and garum (the famous fermented fish condiment of ancient Rome). Extensive paleobotanical remains found in some amphorae and piles of carbonized pomegranates, hay, and walnuts found in the south rooms indicate that Villa B probably functioned as a site for the storage and distribution of foodstuffs. Of equal interest as evidence of commerce and accumulation of wealth are several items: a strongbox, over 200 coins, jewelry, and a seal ring. 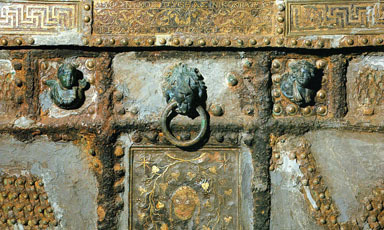 The strongbox, found in the peristyle, may have fallen from the upper floor. It had a wooden framework plated with iron leaves and inscribed “Pythonymos, Pytheas, and Nikokrates, the workers of Herakleides, made [this].” Its exquisite decoration consists of inlay designs and figural bosses in silver, copper, and gilded bronze typical of late Hellenistic decorative design. Furthermore, its intricate locking system was so advanced that similar mechanisms continued in use until the nineteenth century. The coins, ranging in date from the late Republic to the time of Vespasian, hold the potential to shed light on questions of monetary circulation, inflation, and commerce in the region. 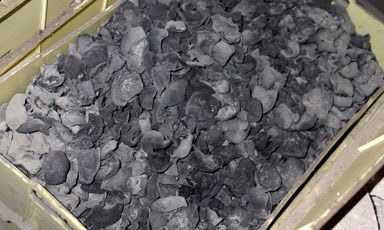 As for the jewelry, further study is needed to understand the different points of manufacture, as well as the techniques employed. The seal ring bears the inscription L.CRAS.TERT. Such rings created seals for business dealings. It is on the basis of this seal that one scholar determined that the owner of Villa B was L. Crassius Tertius, a hypothesis, however, that requires further investigation; alternatively, he could have been the administrator (procurator) rather than owner. The most important find, and one that—properly studied—can shed light on pressing questions, is the discovery of the skeletons of 54 individuals in room 10, one of the large ground-floor rooms that opened onto the southern portico). These were people who had gathered in this room to escape the eruption, and presumably to await rescue from the sea, overcome by the hot gas and poisonous fumes of the first pyroclastic flow that hit Villa B. 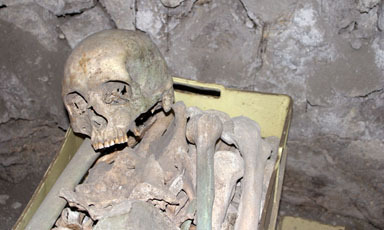 They are a gruesome reminder of the human toll taken by Vesuvius. 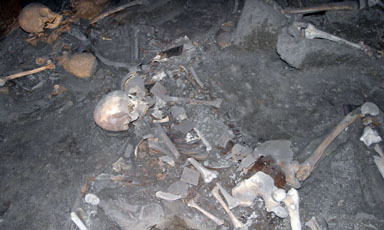 Because they were found in two distinct groups, some scholars attempt to distinguish the skeletons in terms of social status. Those at the rear of the space, bearing no money or jewelry, would be servants and slaves, whereas the group near the entrance to the space would be elites—this because some of them were found with considerable wealth in the form of coins and jewelry.